Paleontology is the study of the forms of life existing in prehistoric times, chiefly by studying the fossils of plants, animals, and other organisms. A paleontologist is a scientist who studies aspects such as morphology, behavior, and how ancient life interacted with their environment. Paleontology is based on uniformitarian geology, which holds that there has been no Biblical flood, but instead it is believed the layers of stata represent vast geologic ages. Based on this assumption, paleontologists examine and characterize fossils. Within paleontology, there are branches and areas of specializations based on the particular type of organism. The study of prehistoric humans is known as Paleoanthropology, animal paleontology is Paleozoology, and the branch which studies ancient plants is called Paleobotany. There are many developing specialties such as paleobiology, paleoecology, ichnology (the study of tracks and burrows) and taphonomy (the study of what happens to organisms after they expire). Paleontology utilizes the same classic binomial nomenclature scheme, devised for the biology of living things by the mid-18th century Swedish biologist Carolus Linnaeus and increasingly sets these species in a genealogical framework, showing their degrees of interrelatedness using the still somewhat controversial technique of 'cladistics'. 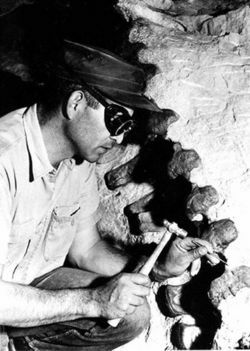 Paleontologists are often incorrectly referred to as archaeologists, because of public perception regarding similarities in techniques (i.e., both "dig in the dirt for old things"). There is somewhat of a blurring between archaeology and paleoanthropology, and even more so between paleoanthropology and some branches of paleozoology. The organized study of paleontology dates from the late 18th century. A paleontologist carefully chips rock from a column of dinosaur vertebrae. History includes a number of prominent paleontologists. Charles Darwin collected fossils of South American mammals during his trip on the Beagle and examined petrified forests in Patagonia. Mary Anning was a notable early paleontologist. She found several landmark fossils, in her home town of Lyme Regis. Although self-taught, she collected and described them in a very systematic way. William Buckland, Richard Owen, Gideon Mantell, Georges Cuvier and Thomas Huxley were important early pioneers, in the field of paleontology. Edward Drinker Cope and Othniel Charles Marsh waged a famously fierce competition known as the Bone Wars in the late 19th century that involved some questionable practices, but which significantly advanced the understanding of the natural history of North America and vertebrate paleontology. Besides looking at mammal teeth and unearthing penguin skeletons. In the 20th century, paleontologists such as George Gaylord Simpson, Norman Newell, Stephen Jay Gould, and J. John Sepkoski, Jr. developed sophisticated mathematical techniques to analyze the fossil record of evolution and extinction, but they have been disputed among scientists. There are also many notable paleontologists in the creation science community. Among them are: Dr. Kurt Wise, Marcus Ross, Dr. John Whitmore, and Joe Taylor. Dinosaur News the free dinosaur magazine (very popular site, with the latest international news about dinosaurs). This page was last modified on 31 January 2012, at 21:31. This page has been accessed 16,027 times.